Solve complex puzzles, explore hidden temples, reconstruct ancient statues, escape deadly platforms and revel in the joy of flight as you recover the life force of the Music Giants and restore rhythm to the world! Recover the Rhythm. Restore the Beat. Close your eyes. Find your courage. Search for the path through the doors of the temple. Discover lost secrets, perhaps even your own. Pause and meditate, but do not let the Matata's tricks deceive you. There is danger in their beauty and violence in their artifice. Listen. Do you hear the rhythm? Long ago, the Music Giants wandered freely, keeping the beat alive. The land of Ota echoed to the sound of their footsteps, and the people of Nchi knew only peace, joy and harmony. Then came the Matata, the interrupters, the stealers of sound. They stole Chúkwú away from the Giants, hoarding their life force and locking it away inside secret puzzles. Now the drumbeat ebbs and fades. Some fear it will be lost forever. But we are not without hope! For the old men sing of one who will unlock the mysteries of the Matata, one who will return the Chúkwú to the Music Giants and restore the balance of our world. His name is Guruki, and his time has come. 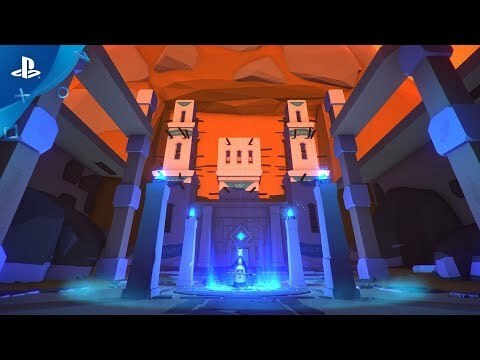 Rangi is a virtual reality adventure/puzzle game exploring a vivid and colorful setting inspired by tribal art, ancient architecture, rhythmic music and African landscapes. Solve cryptic puzzles, reconstruct ancient statues, navigate deadly platforms and discover the joys of virtual flight while unravelling the enigmas of the insidious Matata. Recover the life force of the Music Giants and restore rhythm to the world.